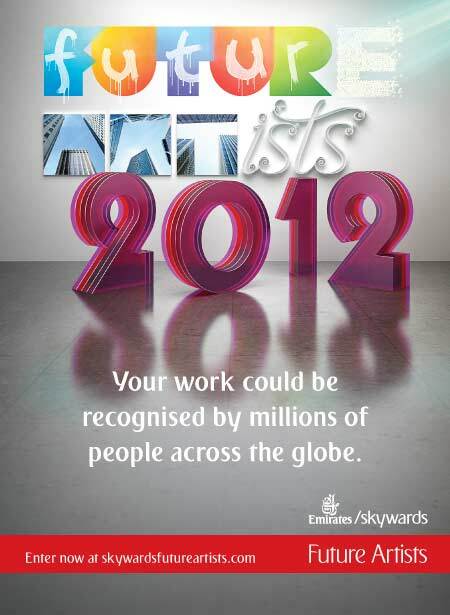 Skywards Future Artists is set to be bigger than ever in 2012. Whether artists are at college, self-taught or have been pursuing their passion for years, Emirates aims to give them the opportunity to gain worldwide exposure through Skywards membership cards. Artists can submit their entries across three broad media categories: Painting/Illustration, Photography/Digital Media and 3D – Sculpture/ Glass/Ceramics. The entries submitted will be judged by a panel of judges and the finalists will be voted upon by Skywards members. The winning artworks will be featured on the Skywards 2013 membership cards. The artist’s name will be displayed alongside their work on the card and will be seen by Skywards’ members around the world. The creators of the winning artworks will receive US$5,000 and have their work showcased through the Skywards membership cards. This year, there is also a prize of US $2,000 for the institution if the winning artists are an art student. We have reached our goal today, one day ahead of schedule! Thanks to all of you great people who have been so supportive, which has and will further inspire us to bring forth a really great and wide portrait of George Maciunas. Raising $20,000 on Kickstarter is a great achievement and we want to tell you how grateful that we are for your generous support, however, the project will need more money for the future steps in the filmmaking. Our project will be online until Friday (midnight) which means we are still welcoming donations and encourage you to keep spreading the word even though we have met our goal. Also, we plan to create a thank you party in the near future here in NYC, so please stay tuned! Please feel free to share this email, contribute as much or little as you are able, and help us make this film! * Polipop is an art world that intersects politics and pop art. It takes serious discussions surrounding geopolitics of global, media culture and livens them up as accessible, eye-catching, fun pop art. With the use of strong primary colors and bold outlines, Cheon’s large scaled digital paintings mimic the language of advertisements, political posters, and propaganda banners. Each unique digital painting is collaged with images from the Internet, rescaled on the computer, and printed on canvas. Polipop and Paintings includes a series of digital paintings (8×5 feet each) coming from Cheon’s mid-career solo exhibit Polipop at the Sungkok Art Museum in Seoul, Korea. The exhibition will also include Cheon’s last hand-painted masterpiece, 15 Billion Years, a mammoth 72×8 foot hand painting. Pledge $50 or more and get a self-portrait photograph (8×10) of George Maciunas AND a signed DVD of ‘GEORGE’. Peter Halley just donated 4 screen prints to the campaign. As some of you may or may not know, I am currently in the middle of making a feature length documentary portrait film about George Maciunas, the founder and impresario of Fluxus. The life and work of Maciunas exemplifies the collaborative spirit that has defined my own practice and has had great influence on generations of artists to follow. George Maciunas (1931-1978) was a Lithuanian born artist, art-historian, graphic designer, architect, urban planner, composer and contractor. Through his tireless efforts, Maciunas has influenced and shaped the course of contemporary art. He is also known for creating the first 15 artist run co-op buildings in SoHo. This documentary film portrait will provide insight into the life of a visionary revolutionary artist. For the last two years I have been traveling around Europe, America and Japan, to film around 40 interviews with friends, family, scholars and professional associates of George Maciunas and Fluxus, including Jonas Mekas, Yoko Ono, Richard Foreman, Ay-O, and Jon Hendricks. I, along with the generous help of dedicated volunteers, have compiled a wide selection of photographs, articles, archival film and Fluxus work from the most important Fluxus collections in the world, including the Jean Brown Archive at The Getty Research Institute, The Sohm Archive at the Staatsgalerie Stuttgart, The Netherlands Fotomuseum, MoMA, and private sources. 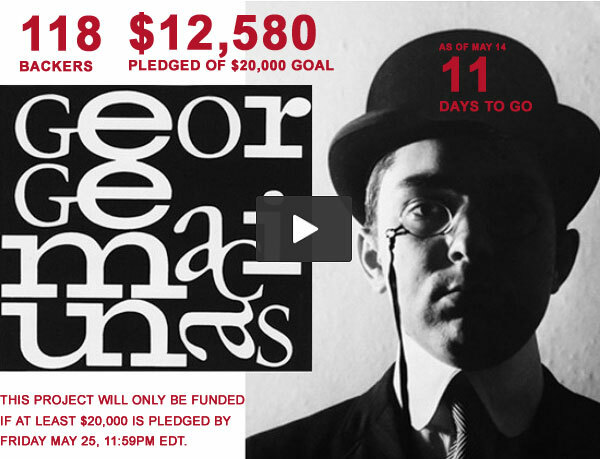 We are now at the stage where in order to complete the film we are in much need of financial support. It is our mission to honor the legacy of George Maciunas which future generations can enjoy, learn and become inspired by. Our goal is to raise $20,000, all of which will go towards production costs: pre-editing, editing, acquisition of additional media, including still photographs and archival footage and the list goes on. As a platform to raise these costs we will go through a site called ‘Kickstarter’ in which we have especially created a teaser for you all to see.